Fluval Aquastop valve A20060. Helpful Links. We will discuss the matter directly with you to ensure that you receive the minimum of inconvenience. Pulling claw design, when you pull the claw, the tweezer is closed and clip the plant. Water grass pliers can also be used to feed animals in low water tanks. Product Category:Aquarium Supplies. Style:water grass clip. Product Code: 86249. As such, we have a huge wealth of experience in online trading. At present we list nearly 5,000 specialist aquarium & pet products suitable for Aquatic, Reptile, Cat and Dog enthusiasts. This is great decoration for planted tank or shrimp tank. Create your own moss ball and enjoy the aquascape. Other plants can be grown on top such as Anubias, Ferns, Bucephalandra, etc. slightdifferences in the colour tone of the website's photo and the actual item. Fluval Suction Bracket A15040. Fluval suction cup bracket with 3 suckers part number a15040. 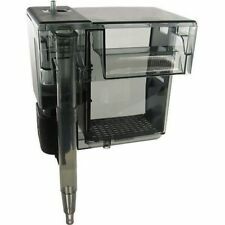 This will fit fluval 1,2,3 and 4 and the plus range and the aquaclear range of powerheads too. It's huge! As such, we have a huge wealth of experience in online trading. Improve digestive system. Protein, Carbohydrate, Phycocyanin, Chlorophyll, Carotenoids, -Carotene, Calcium, Iron, Potassium, Magnesium, Zinc, Folic Acid, Vitamin B1, B2, and B3, and B6, and B12, E, C, K, A, D.
It can be used for both Marine and Freshwater fish tanks up to 300 litres. Ziss Air Valve (ZV-4). 3-watt air pump is sufficient to run each filter (not included). Each filter will treat a system up to 300 litres. KUSURI WORMER PLUS 2,000 gal pack aquarium fish wormer fluke & parasite killer. If any fish is in good health, not picked on and kept in the correct conditions worms should not a problem. But as soon as the fish is stressed or bullied, its natural immunity is compromised and worms or other pest can take a hold. Removes Free Chlorine, Odour, Organic Contaminants, Pesticides and Chemicals. Where you will find a. All our Products Carry a 12 month parts and labour warranty excluding filters. HS/IV41 to IV49/IV51 to IV56/KA27 to KA28/ KW15 to KW17/PA20/PA41 to PA49/PA60 to PA78.